Listen, friends! I have some GRAVE NEWS, well, not that grave. For the rest of December, and also January, we’re moving to a one page a week update schedule, EVERY MONDAY. I want/intend to go back to two pages, but what with the holidays and such, I’m finding myself too pressed for time. This page was nearly late! So, be aware. I may move this to a general news post before the next update. It will be AWESOME if you can update once a week through the holidays. like. A comic a week? SWEET. Well, I only regret the resulting slower pace of the story’s progress with once a week updates. Hopefully I’ll be able to go back to twice a week once I clear my palette over Dec and Jan. I want to point out that this page is the beginning of my master plan to have Fujio take over the comic. It starts with an innocuous lie that spins into a rumor, then erupts into a legend that spreads across Japan! The Demos of Sorrow determine Fujio is a more glorious target, all the ninja girls all fall for him, Ennosuke writes epic plays of his deeds, Maru declares him “supremely badass!”, and he is ultimately declared Masuhiro’s successor via marriage to Ina! Either that or we’ll just be making jokes about the hat for the rest of the comic… yeah, probably that. It’s impossible to be truly badass without an equally badass hat. Yeah, like Samus Aran, or Captain Jack Sparrow, or Indiana Jones, OR GANDALF. ^ I’ll admit that Cho was the first one who came to mind. Did that all come from the top of your head or did you look up a list of famous people/characters with unique headgear? BE HONEST! Honestly, I did a search after coming up with the first six names, but I’m not GoogleFuKlobber, and I didn’t find any list like that, so they’re all mine. (Consider: who would normally put LeChuck or Popeye on such a list?) I did check to make sure Osiris was the one with the sweet hat, though. Let’s not forget the legendary hat of Gilgamesh Wulfenbach! Ooo I hope you like my little comment then, I’m imagining little kids singing it now. Guard: wait! you’re not THE Fujio are you??? the Same Fujio who slayed a thousand men for a hat???! Come on in!!! Like the Demons of Sorrow, but they only give you a small preview of death then ask you to purchase the full package. 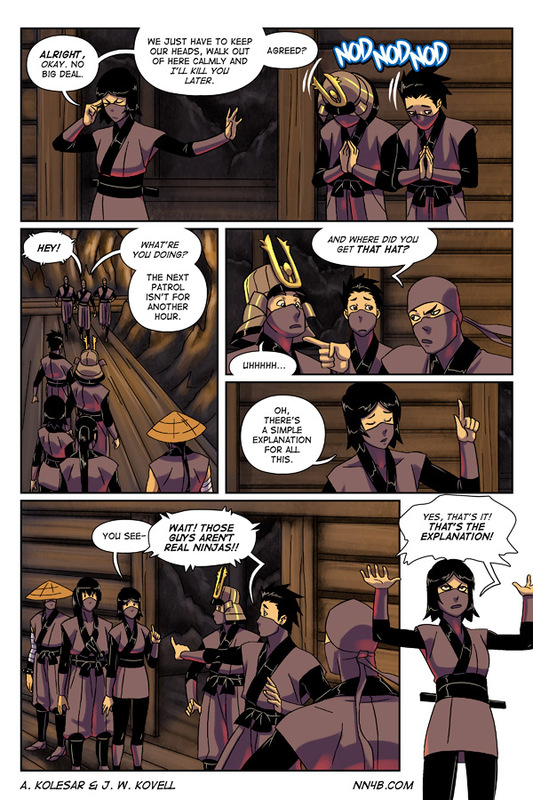 I think that Yori is looking nervous in the first panel because of Ina…Seriously, she’s scary, she’s got daggers coming out of her eyes, and she didn’t say WHO she was going to murder. (Re-posted just because I’m nitpicky and wanted an avatar without just the person silhouette.) I think that Yori is looking nervous in the first panel because of Ina…Seriously, she’s scary, she’s got daggers coming out of her eyes, and she didn’t say WHO she was going to murder. Yori’s gotta stay light on his feet when Ina comes a’seethin’! So many trees fallen. Birdfish will never sing from their branches again. Ken has a wonderful singing voice. Great baritone. It’s as if many birdfish cried out at once, and were suddenly silenced. Holy crap! Ken’s still conscious! He is very good at not dying. Either that, or his daily sake-binges have given his liver supreme antitoxin powers. In other news, Ina’s wroth shall be terrible; her retribution, swift. I look forward to seeing it. Also, I predict that Fujio’s chapeau shall now be a recurring side character. I dub him Wil-san. I approve the LOTR quote. Also, Wil-san? Like Wilson? Is that some sort of Castaway reference? Right on both counts. I salute your cinematic knowledge. I like the detail that the ninja all have one running style, Ina has her own running style, Yori and Cho have another running style, and Fujio and Fumio have a pathetic variation on what Yori and Cho are doing. Surprised the ninja doesn’t notice his new friend in the hat has a rather strange way of running…. Ina has to run like she’s wearing a kimono, because that’s how Japanese girls run, I’ve learned from anime and video games. 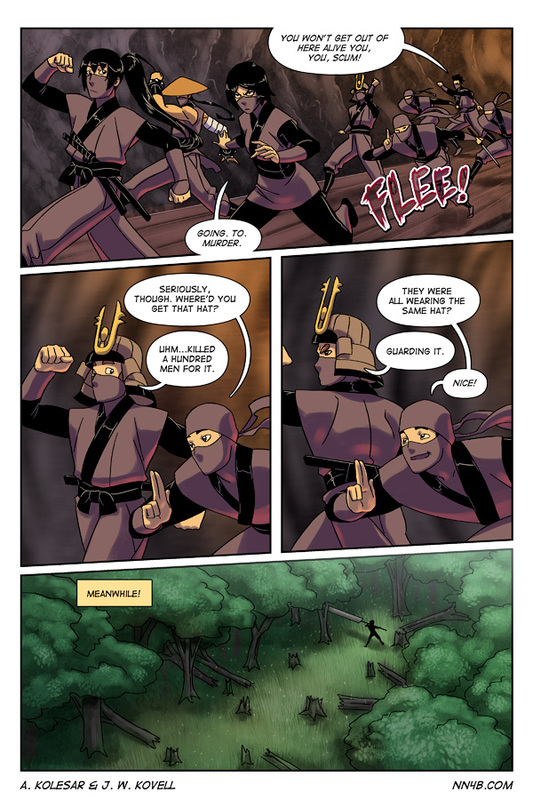 Yori and Cho and just making mad dashes, and the bandits, clearly not much into running, are just trying to keep up with the ninjas, who are doing the standard Naruto ‘run with your arms flailing stupidly behind you’ run.And those ninjas are not the most observant bunch, it would seem. Fujio the Bandit was a happy jolly soul with a corn cob shirt and a button nose and a heart made out of gold! Fujio the Bandit Is a fairytale they say. He was made of snow, but the Ninjas know how that he came to life one fine day. There must have been some magic in that old metal hat they found for when they put it on his head he began to dance around!!! and the Ninjas say he could run away just same as you and me!! I fitting tribute to the legend that is Fujio. All your burning questions will be answered, shocking though those answers may be! I’m surprised the ninja’s haven’t noticed their heretical way of running. Hersey? An extreme connotation! Perhaps the ninjas are just assuming Fumio and Fujio haven’t finished that ninja training yet. Nina Run is one of the advanced classes. a bit expensive but the best hats are only paid for in blood. I hope your students aren’t backstabbing bandits! so, did anyone notice the ninja is making a reference to grinding in an mmo or similar game?